Competition on Hawaii flights is getting hotter than the summer sun in Hawaii. 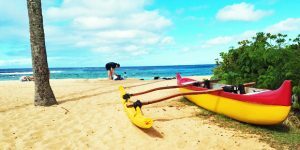 That in advance of the next round of new Southwest Hawaii flights being announced, almost certain to occur this month. Hawaii’s bellwether Hawaiian Airlines isn’t taking the competition sitting down. Read on for more on the lead photo too. Monday, Hawaiian Airlines started flying a new route between Sacramento and Maui. While seemingly not a big deal, it is in the sense that it is known that Southwest will also start flying that route shortly. Alaska Airlines flies that one too, which is seemingly far too much lift for Sacramento. So we’ll have to see who stays and who goes in the next round of what is to be a multi-year battle for dominance in Hawaii air travel. In the interim, travelers on that route will be treated to some of the best fares ever seen. Hawaiian also previewed their new premium seating on the Boeing Dreamliner 787 wide-body aircraft (pictured above), set to be delivered starting in 2021. We don’t know yet what routes will enjoy the new plane, but those are likely to be both international and as well as the longest and most competitive mainland routes. Nonstop to London, here we come. The company will receive 10 of the aircraft and has an option for an additional 10. Business seating will be by Adient Aerospace, a new joint venture between Boeing and car seat company Adient. Hawaiian is the launch customer for the new company. The new business seats, or should we say suites, will be in the preferred 1-2-1 arrangement. As an aside, these seats are referred to as first class on domestic flights, and business class on international flights. The center seats are perfect for couples and, when two are travelling together, the privacy screen between suites can be lowered to convert them into a double bed. Hawaiian is still developing the precise suite configuration, which may also include doors before it is all done. We should see more images soon. The seats are being shown for the first time at the 2019 Aircraft Interiors Expo taking place this week in Hamburg, Germany. The new Adient seats will replace the Optimares branded lie-flat first/business seats in the existing A330-200 fleet. There has been some controversy about those seats and their comfort, design and layout, as may be reflected in this change of manufacturer. Among other concerns, the current A330 seats do not all have direct aisle access and they are in a 2-2-2 configuration. We have not yet flown on the lie flat A330 seats, but will be doing so later this year (which we did using a mileage upgrade from economy). A complete trip report will follow. The reality of economy seating is in stark contrast to that of business/first. Main cabin seating on the new fleet of 10 787 aircraft will be from Collins Aerospace. The Aspire seats are among the industry’s lightest and are designed to maximize seat space, shoulder and hip room, with ergonomically contoured back and arm rests. Hawaiian Air also uses Collins Aerospace economy seats on its Airbus A321neo aircraft. We have found those seats to be quite comfortable as far as economy goes. I heard that ANA Airbus 380 is coming to Honolulu in May. Is the airport upgrades done to accommodate this huge plane? Yes! Gates C4 & C9 have been retrofitted with a 3rd jetway. The 3rd floor waiting area for ANA’s First/Business/Premium Economy class are in its final stages of completion. I just flew from Tokyo into HNL and saw the changes. 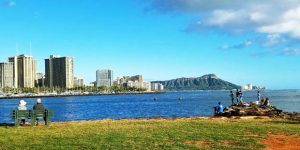 What’s the best way to track the flight prices from Sacramento for Hawaiian vs. Southwest? 🙂 Thanks! Southwest doesn’t list fares on other websites, so you’ll have to go to their website. Other airlines can be tracked on Google Flights among other tools. 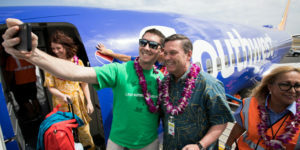 Do you think Southwest or Hawaiian Airlines will be offering non stop from Denver to Hawaii anytime soon? It’s still really expensive to fly to Hawaii from Colorado. Yes almost without doubt there will be new non-stops between Hawaii and Denver soon. We’d bet on Southwest sooner than Hawaiian for that route. I live in West palm Beach. In your experience, is it cheaper to book flight and hotel together, or separate. I am flying to Honolulu in July. It most likely won’t save money to book together, but you might find it more convenient. Airfare is going to be about $1,000 with a quick one-stop connection. They’re both 787s. The last digit usually refers to the variant, which are of different sizes, max takeoff weights, etc. The 787-800 would be the 788, the 787-900 would be the 789, and so on. If you’ll Google the 737, for example, that version goes all the way from 737-100 (731) up to 737-900 (739), and that’s before we add in the various MAX models. The A330s that Hawaiian flies are the A330-200 model, so they’re called A332s for short. The somewhat larger but shorter ranged A330-300 is the A333, for short, and that range issue was a major reason that Hawaiian went for the A332. Have you ever thought about including the rest of the featured story on the first web page, so we don’t have to click on a link to get the story? I know it’s a small thing, but I find it annoying. Dreamliner 789? 787? What are the differences? 787 is the model of the plane, 789 is a different variation of the 787. There are three different variations……787-8 (186.1 feet), 787-9 (206.1 feet), 787-10 (224 feet). The longer the plane, the more seats it has. 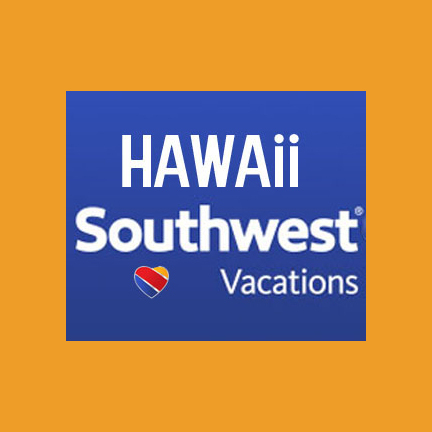 I would like to have information regarding best flights from LAX (or L. A. area airports), and if you know if Southwest will be flying to Kauai, please. Everything is contained here: https://beatofhawaii.com/southwest-hawaii-airline-update/. If we missed anything, please just let us know. Thanks for the update. I’ve flown First/Business on the A330 a few times (to the islands and Australia from Phoenix) and find them very comfortable. I sleep every time I’m in one. They are definitely an upgrade over the 767. Sounds like the 787 will be even better. 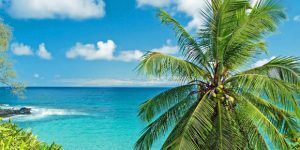 Keep up the great travel tips for Hawaii and enjoy your upcoming First Class flight.